WASHINGTON (Reuters) - The FBI is pursuing 1,000 investigations into suspected "lone wolf" militants and another 1,000 into "domestic terrorists," FBI director Christopher Wray told a congressional committee on Wednesday. At a Senate Appropriations Committee subcommittee hearing, Wray said lone wolf terrorists - whom another law enforcement official described as individuals often radicalized over the internet or other social media - are the Federal Bureau of Investigation's "highest counterterrorism priority at the moment." Wray said the FBI has about 1,000 investigations into suspected lone wolves in all 50 states, "and that's not even counting the al-Qaeda investigations, the traditional ISIS investigations, the domestic terrorism investigations ..."
"And what makes it so hard is that there are not many dots to connect with some of these people," he said. "They pick soft targets, they use easy-to-use weapons; you know, IEDs (improvised explosive devices), cars, knives, guns." 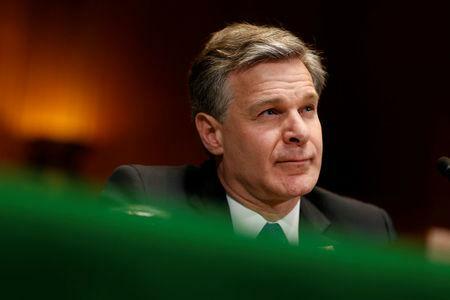 Wray said the FBI is "trying to get better at looking for red flags" that could signal when people becoming radicalized might start to consider taking action. In addition, Wray said, the FBI is pursuing another 1,000 investigations into "domestic terrorists." The second law enforcement official, who spoke on the condition of anonymity, said right-wing extremists, violent animal rights and anti-abortion extremists, and African-American or left-wing militants fall into this category. This official said, there is an "overlap" in FBI statistics on the number of lone wolf investigations and investigations related to the Islamic State movement. Patrick Leahy, a senior Democratic member of the appropriations committee, said that as part of the annual budget request the FBI had presented, President Donald Trump's administration reduced the Bureau budget by 5 percent, rescinded planned allocations of $148 million in salaries and expenses, and dropped or at least postponed plans for a new FBI headquarters.